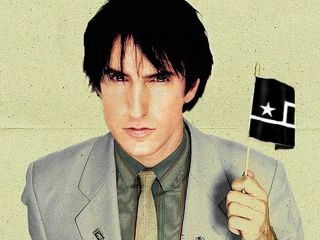 Trent Reznor has spoken out against the use of Nine Inch Nails' music for the purpose of torture at Guantanamo Bay. As previously reported, the US military has been playing excruciatingly loud music in order to 'break' prisoners, but Reznor is firmly opposed to the practice. Writing on his blog, he says: "It's difficult for me to imagine anything more profoundly insulting, demeaning and enraging than discovering music you've put your heart and soul into creating has been used for purposes of torture. "If there are any legal options that can be realistically taken they will be aggressively pursued, with any potential monetary gains donated to human rights charities." He concludes by taking a pop at the outgoing US president: "Thank GOD this country has appeared to side with reason and we can put the Bush administration's reign of power, greed, lawlessness and madness behind us." Earlier this week, it was reported that a new initiative, ZerodB, has been set up with the aim of gathering support from musicians who want to see 'torture by music' banned.